IVRCL Ltd (BSE: 530773, NSE: IVRCLINFRA) counter in National Stock Exchange witnessed a significant buy of 16 lakh shares by Merrill Lynch Capital Markets Espana SA SVB, a prominent Foreign Institutional Investor, on Friday, 13th April 2012. The buy amounted to almost 0.60% stake in the infrastructure major, and had no identifiable institutional sellers as counterparties. At Rs. 73.97 a share, Merrill Lynch’s buy into IVRCL stock is worth Rs. 11.84 crore. StockExplain had earlier reported that another noted FII, Norges Bank, which is the central bank of Norway, had sold off 0.60% in IVRCL on February 16th. As of Q3 end, the key Norges Bank arm, The Government Pension Fund Global, was the largest non-promoter shareholder in IVRCL with a 9.47% stake. The Norges Bank’s sell was at Rs. 59.28 a share, and post that sell the stock had corrected up to Rs. 48.60, which was a loss of 18%. The scrip also remained range-bound between Rs. 48-59 for more than a month since then. Macquarie Bank, an existing investor in the counter, was a noted buyer during this period of correction, accumulating 14.48 lakh shares at Rs. 53.34 a share. Anyway, by March 21st, the tide started changing for IVRCL when it became clear that two companies belonging to billionaire businessman Subash Chandra led Zee/Essel Group had started accumulating the infra company’s shares from the open market. StockExplain had in its earlier news report pointed out the low promoter stake of 11.18%, as a peculiarity of IVRCL stock. Not surprisingly, what many observers initially thought of as a value investment for Zee/Essel Group, quickly transformed into a battle for control. In a series of 7 bulk deals in BSE & NSE between 21st March and 3rd April, the Subash Chandra companies have acquired more than what IVRCL’s promoter is holding. These companies, Asian Satellite Broadcast Pvt Ltd and Jay Properties Pvt Ltd, now holds 12.27%. Essel Group has also announced its intention to take control over IVRCL by buying out the stake of the company’s founder and promoter, E Sudhir Reddy and his family. Though Sudhir Reddy has until now brushed off the threat, citing support from institutional investors, the general market has driven up the stock from Rs. 55.23 at which Essel Group companies first identifiably bought it, to as high as Rs. 75.20 in recent days, which is a gain of over 36% within less than three weeks. Though there are many stories doing the rounds like an expected Open Offer from Essel at Rs. 90 a share, institutional investors warming up to Essel, counter offers from IVRCL, or just continuous market buys by either to win the battle for control, not everybody is believing. Noted institutional sellers during this run-up include HSBC Global Investment Funds Mauritius and Religare Finvest. HSBC offloaded 20.73 lakh shares or 0.77% at Rs. 64.41 a share, while Religare has sold off on Thursday 86% of the 27.31 lakh shares it acquired just a day before. Both sells had no identifiable or large counterparty buyers. However, for HSBC it is only a part sell, as it was the second-largest non-promoter shareholder as of Q3 end, with a 7.52% stake. 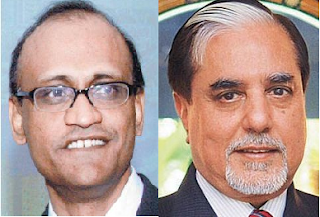 Another point of disbelief whether there would be an all-out battle for IVRCL is the already existing business connections between Essel Group and IVRCL for some key infra projects. Though the connections are indirect and routed through some third-party intermediaries and SPVs, they are of much significance as they involve large projects. Apart from these, the two groups have also openly bid for some infra projects in the past. Despite Friday’s significant buy by Merrill Lynch, IVRCL shares ended 1.49% down in NSE, at Rs. 72.80, which reveals that there is selling pressure in the stock after the huge run-up in recent days. Apart from Norges Bank and HSBC, other significant institutional holders in IVRCL include, ICICI Prudential Life Insurance Company, FID Funds Mauritius, Bajaj Allianz Life Insurance Company, The Master Trust Bank of Japan, Macquarie Bank, Aviva Life Insurance Company India, Tata Trustee Company, and Dimensional Emerging Markets Value Fund. The 42.52% stake held by these institutions will be key if a tussle ensues between Sudhir Reddy and Subash Chandra for control of IVRCL.